Microbial Metabolic products are the low molecular weight compound, necessary for the cell’s or body metabolism processes. These products are classified as the primary and secondary metabolites. The primary metabolites consist of the vitamins, amino acids, nucleosides and organic acids, which are necessary at the time of logarithmic phase of microbial growth. But the products like alkaloids, steroids, antibiotics, gibberellins, toxins are the secondary metabolite compound produced during the stationary phase of the cell growth. The microorganisms possess the tremendous capacity to synthesize the variety of products that are commercially used. 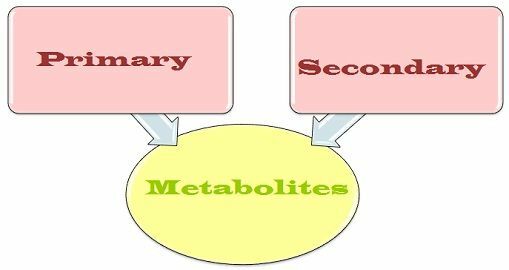 The substantial difference between the primary metabolites and secondary metabolites are discussed hereunder, along with their importance in microbiology. Meaning The metabolism products that are produced during the growth phase of an organisms in order to perform the physiological functions and supports in overall development of the cell are called primary metabolites. The end products of primary metabolism that are synthesized after the growth phase has been completed and are important in ecological and other activities of the cell are known as secondary metabolites. Also known as Trophophase. Idiophase. It occurs at the Growth phase. Stationary phase. Production These are produced in large quantities, and their extraction is easy. These are produced in small quantities, and their extraction is difficult. Occurrence Same in every species, which means they produce the same products. Varies in different species. Importance 1.These products are used in industries for various purpose. 2. Primary products play the significant role in the cell growth, reproduction and development. 1.Secondary metabolites such as antibiotics, gibberellins are also important. 2. They also indirectly support the cell, in sustaining their life for long duration. Examples Vitamins, carbohydrates, proteins and lipids are some of the examples. Phenolics, steroids, essential oils, alkaloids, steroids are few examples. 2. Primary metabolic end products. 1. Primary essential metabolites – These are the important compounds requires to sustain the process of cell growth, and hence these are produced in adequate amount. Vitamins, nucleosides, amino acids are the example of the essential metabolites. 2. Primary metabolic end products – Compounds such as ethanol, acetone, lactic acid, butanol are the normal end products of the fermentation process of primary metabolism. Although these products are not important, sometimes have industrial importance too. For instance, carbon dioxide is the metabolic end-product of the Saccharomyces cerevisiae, but it (CO2) is important in the baking industry for leavening of the dough. Excessive production of the primary metabolites is very important and useful in the large scale purposes in industry. Even the enzymes find during the process have many uses in food production, textile finishing, and other industries too. After the trophophase or as soon as the exponential phase ends, the process enters into the another phase called as idiophase or secondary metabolism. The products are called as secondary metabolites (idiolites), which are produced at the end of the process. This phase occurs at the period of the limited nutrient or when there is the accumulation of the waste products. Although the compounds like antibiotics, alkaloids, steroids, gibberellins, toxins, etc. do not have the direct relation to the synthesis of cell materials and their growth, but are produced in small quantity. Hence secondary metabolites are considered as the end products of the primary metabolites. Secondary metabolites are produced by very specific microorganisms only, mainly antibiotics and other products are used. Generally microorganisms synthesize numerous group of secondary metabolites compounds instead of one, for example, a strain of Streptomyces produces 35 anthracyclines at a time, instead of one. These are not required for the growth, reproduction, and development of the cell. As stated above, that secondary metabolites do not directly benefit the cell growth and development, but they perform some unknown function which supports the cell survival. The primary metabolites are considered as the products that are produced during the growth phase of organisms and are primarily involved in the growth and development of an organism. On the other hand, secondary metabolites are said to be as the end products of the primary metabolites, involved in the stationary phase during the growth of a microorganism and play a role in ecological functions. Primary metabolism pathway occurs at the growth phase and is also known as trophophase while the secondary metabolism pathway occurs at the stationary phase and is also known as idiophase. Primary metabolites are produced in large quantities, and their extraction is easy, in fact, the products are same in every species, whereas secondary metabolites are produced in small quantities, and their extraction is difficult, even their products are different for different species. The products manufactured during the primary metabolism pathway are useful in industries for various purpose and also plays very important role in the cell growth, reproduction and development.Whereas secondary metabolites such as antibiotics, gibberellins are also important and they also indirectly support the cell, in their survival for a long time. Examples of primary metabolites are vitamins, carbohydrates, proteins, and lipids while secondary metabolites examples are phenolics, steroids, essential oils, alkaloids, steroids are few examples. Microorganisms have the formidable capacity to produce numerous products, during their life cycle. Some of these products have a great importance, while some are said to be as waste end products. Though from the above description, we conclude that the two types of products produced during the cell growth are categorized as primary metabolites and secondary metabolites. These products are classified by their importance during the cell growth. So nice easy to understand thanks a lot for help this website.